Everyone and their gay brother raves about Tweezerman tweezers it seems, but my god they cost a smooth penny. I need a new pair of tweezers, but I do not know if I want to spend $15 (we talkin' Amazon prices) on something my cat is liable to lose under the sofa. I have way too much Italian ancestry to not use them regularly, either, so it's not like they just sit somewhere gathering dust for months at a time. They're good, solid, though eyeball the little sleeve thing real closely, because I did once encounter a pair that weren't perfectly aligned, and they tended to nip off/snap a hair rather than pluck it. Have had their needle nose, flat nose, and angled varieties over the years for various things and splurged on a travel set I <3'd them so very much. I got the triple set, in the pink pouch, with the three different types. Totally worth it and it came with a mirror. So something I learned as an adult that I never knew in my younger days is the colored section at the bottom of lipstick tubes that looks like it's just there to show you what color it is? @auspice buh, I had no idea. I rarely wear actual lipstick - it just doesn't last, and if I'm going to wear something that doesn't last, I wear gloss so I can reapply it without looking. But that's neat. Yeah, it kind of blew my mind when I learned. It was a 'no wai' moment where I ran to my makeup bag and grabbed the tubes to pop off their bottoms and stare at the resulting little cups of color. I don't wear it often either. I've come to really appreciate ColourPop's staying powah. It's matte and it STAYS (plus it's inexpensive). I've had good luck with their ultra satin lip, which seems to function on me the way liquid lipsticks function on others. Like, I've legit fallen asleep with it on and woke to only a tiny smudge in one corner. I've used their lip liners with gloss over them, works pretty well. The Burt's Bees 'tint of color' type -- I forget what they're officially called -- are a good option, too. And they're nice on the moisturizing and whatnot. Main downside is a dearth of color options. I tend more toward rusts and neutrals, since any neutral red or blue toned red looks NEON HOT PINK MAGENTA WOW HI BARBIE HOW YA DOIN' on me. Super not flattering. :/ (Nail polish, too, grar... ) Intentional deep/dark wines or shimmery dark magenta at least works with the green hair. It very much did not even the littlest bit with the red. 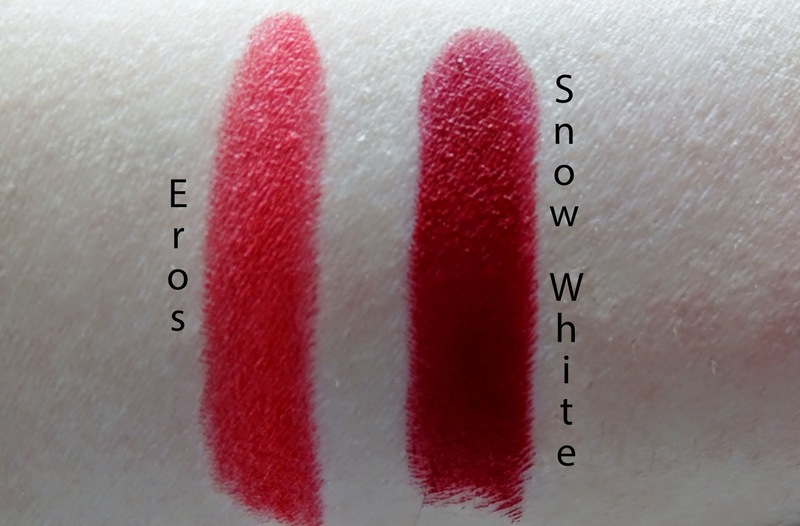 I wore Eros yesterday and tried that trick of patting a bit of powder over it that I've seen suggested. It dulled the color a bit... but it worked?!?! It does dry your lips, so if you need moist lips all day (like if you spend your whole day chatting, etc etc) I do not recommend it, but I didn't have any color transfer to my water bottle and I had color on my lips the whole day. So. uh. this is a trick I will def. be using going forward. fo sho. That looks not too dissimilar from Snow White up there, but is def. not cheap. ...just louder and more painfully. The red that literally anyone and everyone can wear. There's been studies! I really need to go into Sephora and get color matched for Fenty foundation. It's cheaper than the UD foundation, which is so far the only other brand that has the right shade for me (being pale, but with a bit of olive undertones makes it so hard for me to find the right fit and I think Fenty will help...). @auspice MAC may also. They were able to match me, and I'm the same kind of impossible. I got 'we normally only sell this to Asian women who are very very very pale'. It lasted FOREVER. Not cheap, but it lasted long enough to make it more than worth it. I need to eventually get around to replacing that thing, I just have to do it when I haven't been out in the sun constantly, or it throws everything way off with the 'instantly tan forever because I went outside for five minutes'. @surreality ^ This. I was color-matched a Sephora, where the test they give you spits out a color code that works with any product in their store. The yellow undertones in my skin are so strong, I'm about two shades darker than "as pale as the spectrum registers" and "as far into the yellow end of the spectrum as we have." Surprise surprise, I have an easier time buying foundation from Korean brands than US ones. Thanks, adopted grandpa of unknown Meditteranean-ish origins!